The Registrar of Voters Office posted new results today, Saturday, November 26th and, according to their site, the next report will be Monday, November 28th. 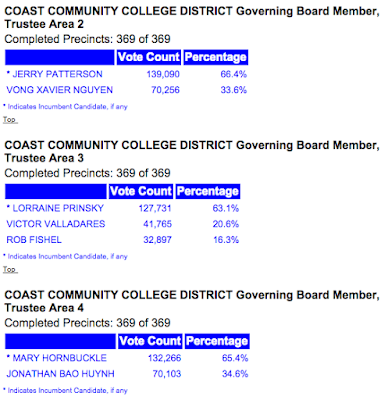 There remain 44,478 total Orange County votes left to count. You can see all the results for the OC Races HERE. Sandy Genis retains a 221 vote lead over John Stephens, who, in turn, holds a 2,532 lead over Allan Mansoor. 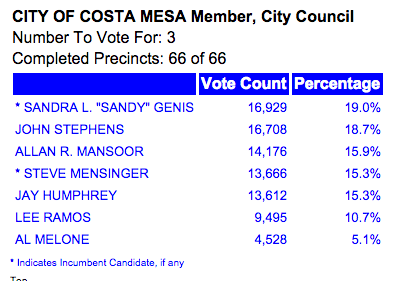 Mayor Steve Mensinger trails Mansoor by 510 votes for the third seat. Jay Humphrey is only 54 votes behind Mensinger. Lee Ramos and Al Melone trail the field. 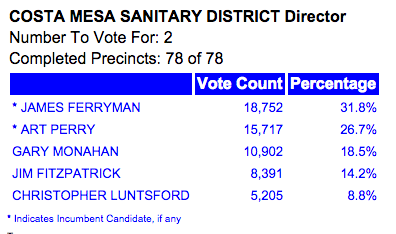 Incumbents Jim Ferryman and Art Perry hold commanding leads for the two seats available. Gary Monahan trails Perry by 4,815 votes. Jim Fitzpatrick and Christopher Luntsford trail the field. Incumbent Jim Fislers lead has not changed on challenger Alex Reich. Measure AA, the citizen-generated initiative designed to protect Fairview Park from development of any type, continues to pass by an ever-growing margin - well beyond 2-1. Measure BB, the City-generated measure designed to confuse and deceive voters, is failing at the polls. Both citizen-generated measures to permit the sale of medical marijuana in the city - Measures V and W - are both failing at the polls by sizable margins. Measure X, the City-generated measure to restrict medical marijuana activities to a small corner of northern Costa Mesa - with no retail sales permitted - is passing by a more than 2-1 margin. This measure, the vote-by-districts measure placed on the ballot as a result of a legal settlement, was hijacked by Mayor Pro Tem Jim Righeimer and was expanded to form 6 voter districts AND include a directly-elected mayor. 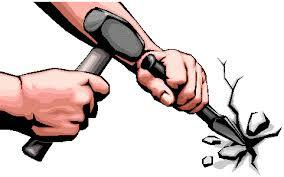 This, too, is passing by a 2-1 margin. 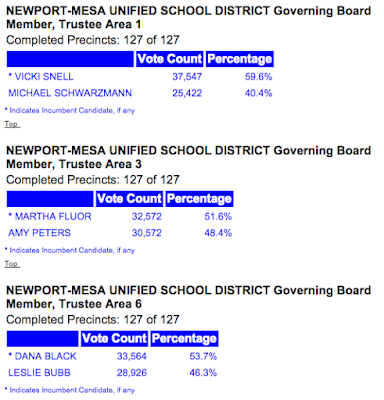 This meaningless measure, placed on the ballot by the Mesa Water District Board of Directors to try to snooker the voters into "approving" the consolidation of Mesa Water and the Costa Mesa Sanitary District, is passing. Fortunately, it means absolutely nothing. Any consideration of consolidation of the two special districts will be the purview of the Local Agency Formation Commission (LAFCO). 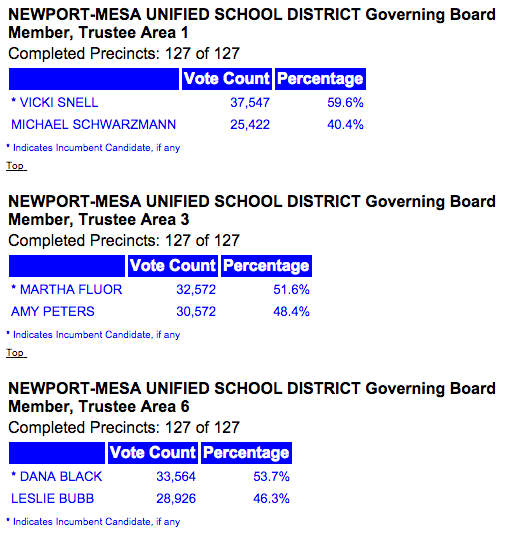 All incumbents in these races have wide margins on their challengers. Incumbents in these races are also holding significant margins over the challengers. I expect the next report will be Monday evening, so I will report the results then. They only managed to count about 10% of the remaining votes for this report, so it's still likely that the completion will stretch to their deadline of December 8th. mensinger is not going to break $10 a vote! Steve will claim that massive voter fraud cost him the election when 10,000 write-in votes for "Mensheimer" were not counted. Fisler will don his spiffiest outfit and hold an open house at one of his listings. When the sandwich tray arrives and the crusts of the sandwiches are missing, Fisler will blame Alex Reich. Well put, McEvoy. He has never been good with money, especially when it's not his own. Remember Righeimer math? I was watching when he tried to count on his fingers on one hand and came up with six.